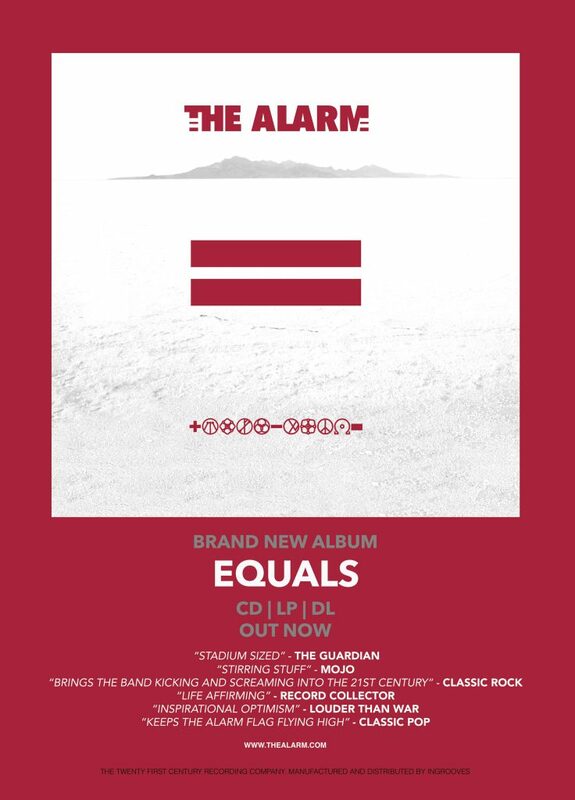 HomeNewsThe Alarm = EQUALS = Back In The Charts! 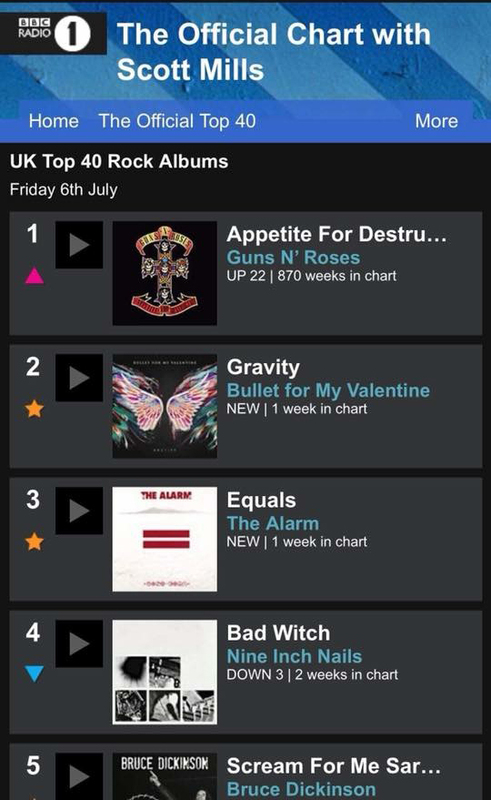 The Alarm’s brand new album EQUALS (released June 29th), has put the band back in the Official UK Top 75 for the first time in over 27 years, along with a Number 3 placing on BBC Radio 1’s New Rock Album Chart and also at number 25 on the iTunes Album Chart. Equals has also received a hail of excellent press reviews including praise from The Guardian, Classic Rock and Mojo along with similar positives from Louder Than War, Vive Le Rock and many other respected entertainment sources. Tracks from the album itself have also been receiving coast to coast airplay in the USA with ‘Beautiful’ being played at KLOS in Los Angeles and at WFUV in New York. Some of the band’s classic music has also featured in NetFlix hit TV series ’13 Reasons Why’, boosting The Alarm’s listenership on music streaming services such as Spotify (which has more than doubled in recent months), and seen the group secure iTunes Essentials and This Is The Alarm playlists. 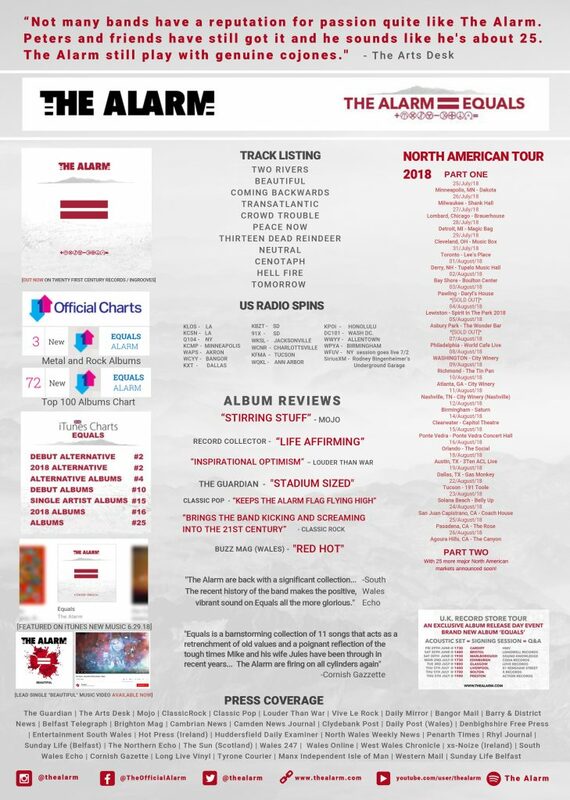 The Alarm will embark on a massive 27 date North American Tour on July 25th Click here for Tour Dates and Ticket Information. NB: A further 25 Major North American City Tour Dates to be announced soon, including the already announced date at Slims in San Francisco on October 27th (Tickets available here). Tickets and Weekend Passes for The Gathering 2019 are also selling fast and on sale here.